I love the flavors of summer. Kristi from She Eats asked on her FB page what fresh item I'm most looking forward to this summer, and my answer was tomatoes. That's a no-brainer for me, primarily because my second favorite summer flavor, peaches, can be captured and frozen for later use. True, my Fresh Tomato Pesto is one easy way to capture the flavor of ripe summer tomatoes, but I can't match that texture and wouldn't use it in a tomato sandwich. I love a good tomato sandwich more than anything else, and now that our Community Supported Agriculture (CSA) farm share is providing us with ripe tomatoes I am indulging often. While I do like to bite into a juicy peach (one not packed with listeria bacteria and shipped 'a fur piece') I'm not married to the texture. I'm happy to have fresh summer peach flavor in whatever form I can put it up. Since we don't have any local peaches this year due to the extreme cold temperatures of late winter, I'm glad I put up the peaches I gleaned from a friend's tree last year. Most of the peaches were put up using Carla of Chocolate Moosey's Peach Pie Filling recipe, but some I just chopped, mixed with a bit of sugar, and froze. 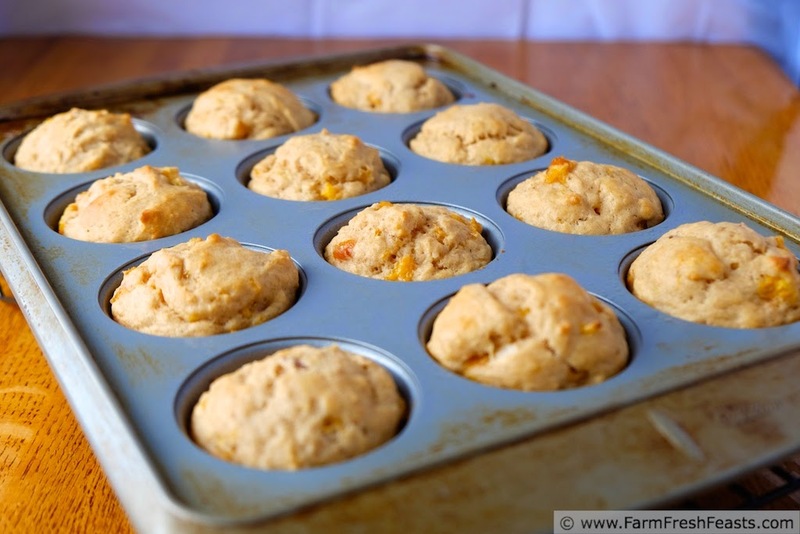 This method makes it easy to thaw and use in a variety of sweet treats like these muffins. Even though it sounds like medieval torture, macerating just means 'softening by steeping in liquid' so that's the term I used here. 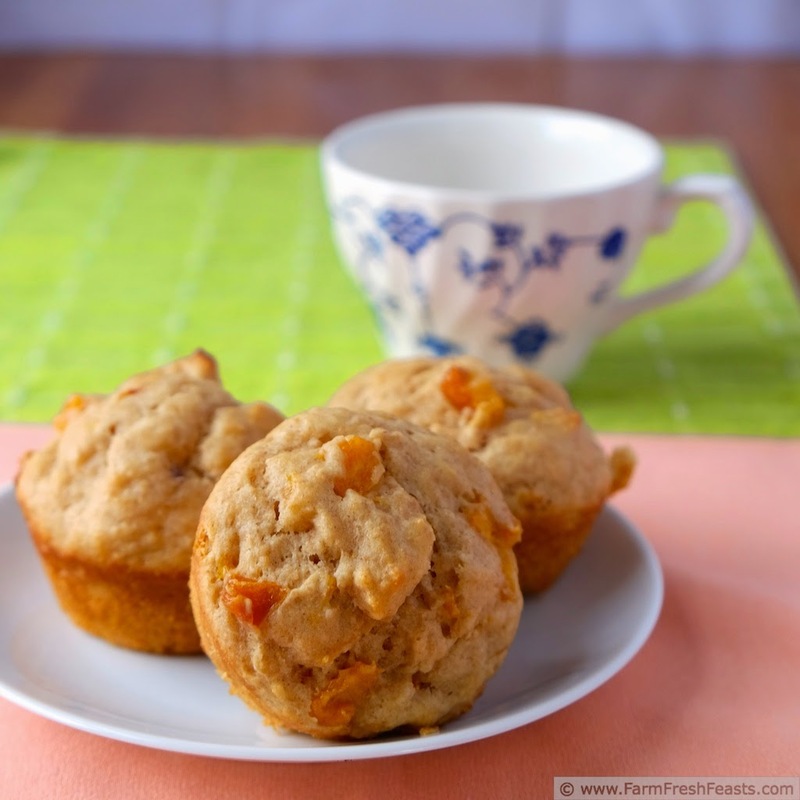 While you have fresh peaches may I offer my Fresh Peaches and Cream Muffins? 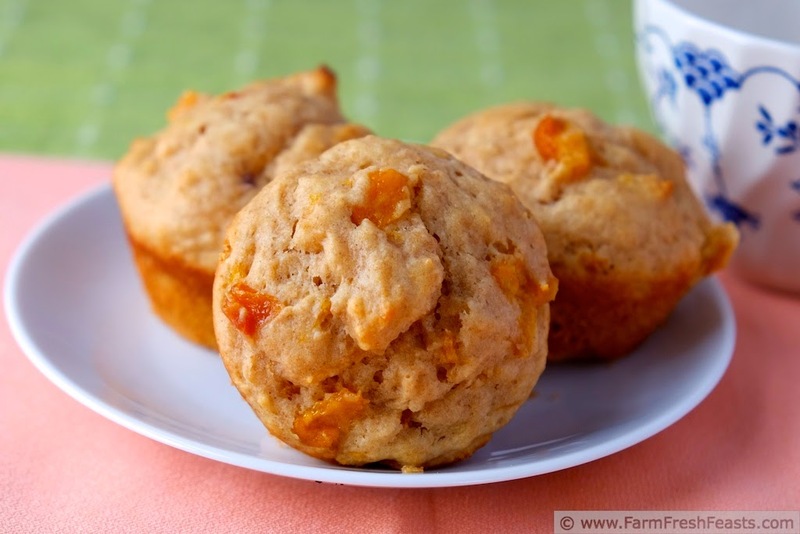 If you've got macerated peaches, though, and want muffins--do try these. Thanks! Preheat oven to 400 degrees. 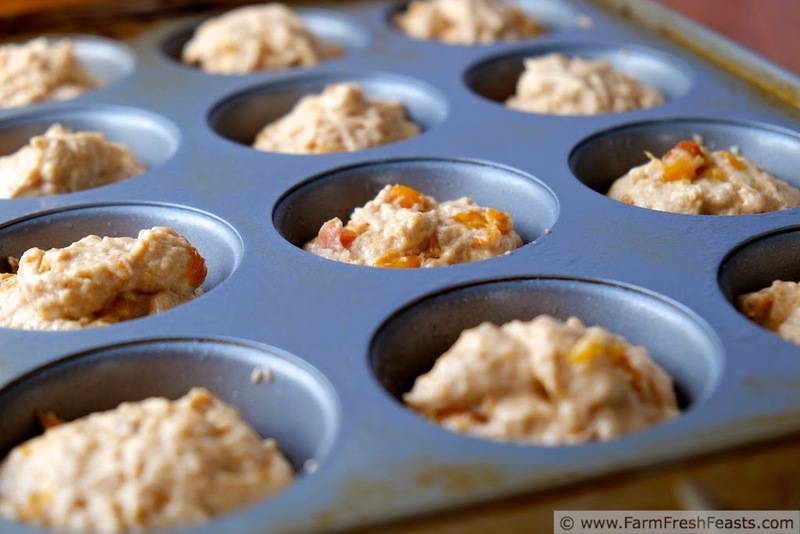 Spray a muffin pan** with oil spray or line with paper cups. 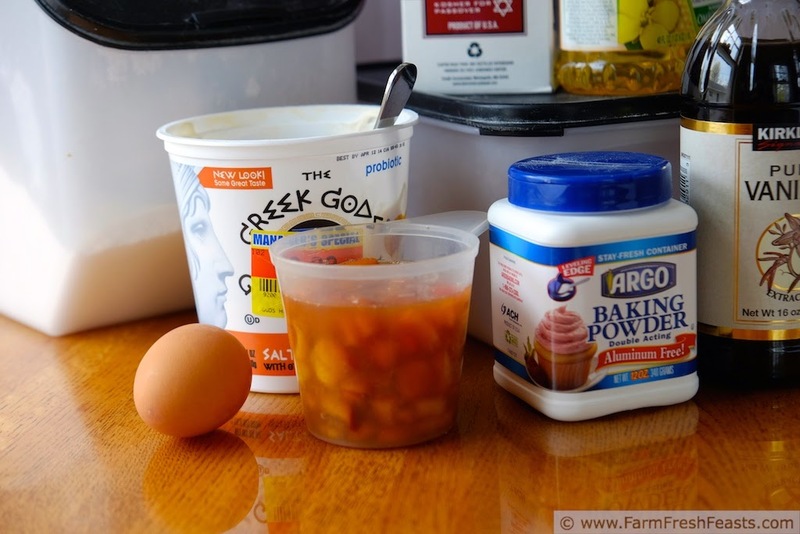 In a large bowl combine egg, peaches, Greek yogurt, oil and vanilla until thoroughly mixed. Dump dry ingredients on top, and stir until just combined. Scoop** into prepared muffin pan. Bake for 15 minutes, then cool in pan for 5 minutes before transferring to a rack to finish cooling. Or eat warm. Your choice. 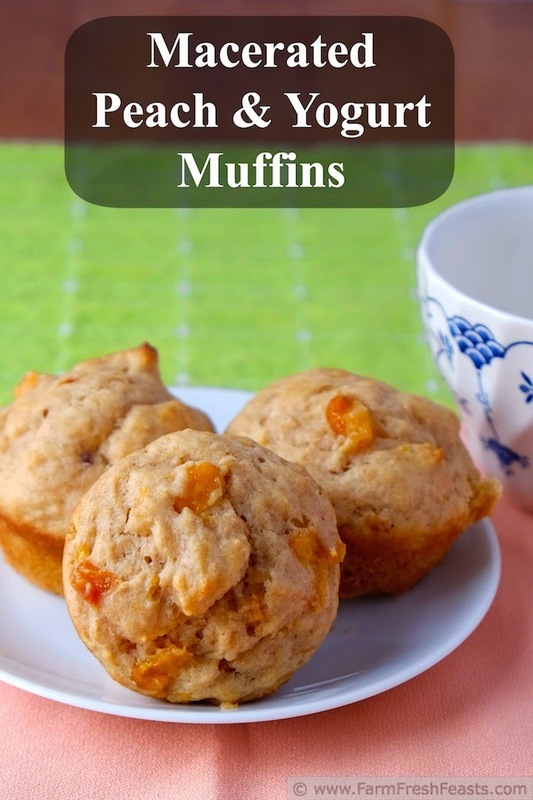 **My scoop holds 3 Tablespoons (1 ½ ounces) by volume, though the muffin batter is mounded in the scoop so I'm pretty sure I'm putting a good 3 ½ Tablespoons into each muffin well. The muffin wells in my regular muffin pans each hold 3 ounces by volume. Wish I had these for breakfast right now! Thanks for linking up with What's Cookin' Wednesday! I love these, and thankfully I have one bag of frozen peaches left from last year. I'm still missing our peach goodness this year. I liked to eat them over the sink, while the juice ran down my face, my hand, and my arm. I am watching the temps this winter, trying to gauge if we'll have a late freeze this year. Not that I can do a darn thing about it, but I'm hopeful!